In today’s podcast we’re talking to a modern master of the electric bass. 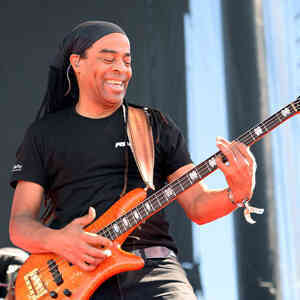 Best known for his work with Living Colour, Doug Wimbish can look back on an esteemed career that began in the early 80s when he was recruited by Sugar Hill Records to join the rap label’s house band. Along with guitarist Skip McDonald and drummer Keith LeBlanc, Wimbish went on to play on some of the biggest hip hop anthems of the time, including ‘White Lines (Don’t Do It)’, ‘That’s The Joint’ and ‘Apache’. It wasn’t long before Doug began landing gigs with the likes of the Rolling Stones, Jeff Beck, Bruce Springsteen, Madonna, Seal, Joe Satriani, James Brown and George Clinton, his high demand earning him the title the ‘Journeyman Bassist’. Best known for his work with Living Colour, Doug Wimbish is a modern master of the electric bass. About Doug’s journey into music. How he refined his expertise in the studio. All about his time with Sugar Hill Records. About the highs and lows of his career so far.